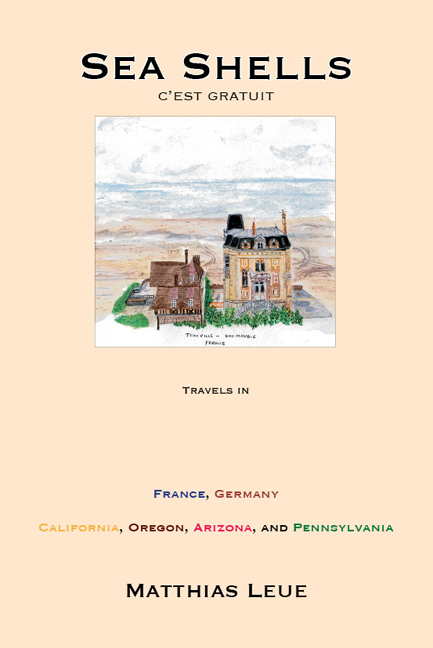 My book “Sea Shells, C’est Gratuit” underwent a minor change this week. The content is still the same, but I took advantage of the printer’s offer to upgrade to their premium paper for free. It is now printed on 70 lb. paper, making the pages less translucent as well as making the book a bit thicker (fattening it up for the winter). This entry was posted in Book News and tagged book update on December 9, 2014 by matthiasleue. 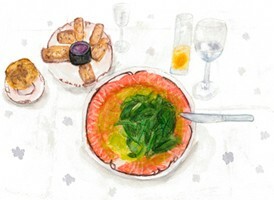 This watercolor is from the back cover of, and it is also contained inside my latest book “Sea Shells, C’est Gratuit”. The state of Thüringen lies in the former East Germany, and after the fall of the wall (which is now probably considered ancient history), is accessible to all people once again. It is especially beautiful in the summer, when the golden wheat fields, flanked by long rows of trees (Alleenstraße), exude the abundance of a harvest yet to come. Sweet smells, sounds, and colors of the country — dragonflies and butterflies doing their summer dance; red poppies peeking up through the wheat stalks, cornflowers boasting their Prussian blue. I recall many years ago, visiting my parents with my young sons — when Germany was still divided and Thüringen was not accessible. 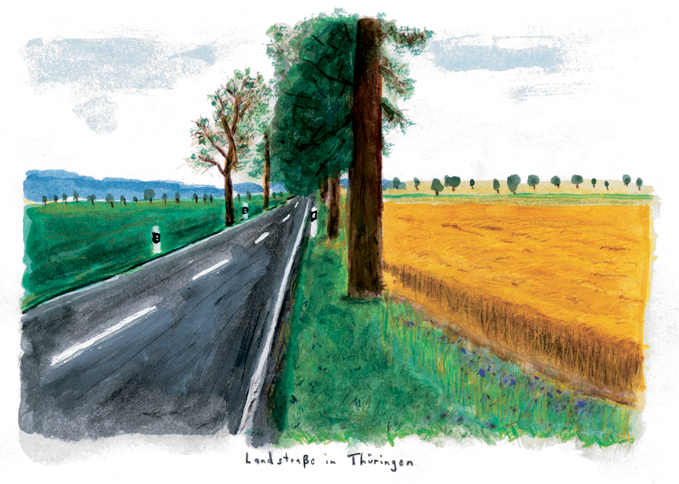 We took a trip to the border — Thüringen was in plain sight — and saw an East German rabbit blatantly trespassing from East to West, oblivious to the ominous guard towers (I don’t believe he was in possession of a passport either). Thank God, the Wall is now long gone. The rabbit’s descendants (the ones, that have not landed in their proper place — a pot) must surely populate a united Germany now. This entry was posted in Blog Posts, Book News and tagged cornflowers, Germany, history, poppies, Prussian blue, summer, Thüringen, The Wall on March 2, 2014 by matthiasleue. 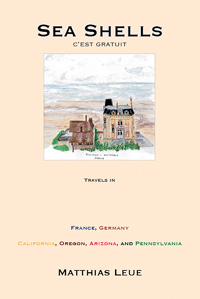 I am delighted to announce, that my second book “Sea Shells, C’est Gratuit” was just published on December 1, 2013. It is a color version of my book Fish Camping, and has an additional short story in it, that takes place in Oakland, California. It features the beautiful artwork of my sister-in-law, Anne Leue. This entry was posted in Blog Posts, Book News and tagged 2013, new book, Sea Shells on December 2, 2013 by matthiasleue. I am happy to announce, that my book “Fish Camping” is now available as an eBook on Amazon.com in the Kindle format. Thank you to Sleeping Cat Books for doing such a great job of converting it to this format. Also, my cat Calvin personally approved my choice of editor. This entry was posted in Blog Posts, Book News and tagged 2013, Amazon.com, Calvin, eBook, editor, new, sleeping cat books on July 30, 2013 by matthiasleue. I am working on a new book (my second one). It is a color version of my book “Fish Camping”, featuring some lovely drawings by Anne Leue. The book will also contain an additional story written in 2012. Publication date is somewhere between summer and fall. This entry was posted in Blog Posts, Book News and tagged 2013, drawings, new book, news on June 17, 2013 by matthiasleue.